Graumanschinese.org / Forecourt Honorees / R2D2, Darth Vader, C3PO and "Star Wars"
One-sheet poster for Star Wars, Tom Jung, illustrator, released in May, 1977. Opened Nationwide on Wednesday, May 25, 1977 on 32 screens. The buzz about Star Wars had been building for months since the release of its sensational trailer. When the film opened at Mann's Chinese in Hollywood in all of its 70mm Dolby Stereo glory, audiences went nuts, embracing all of the characters to the point where they quickly formed a new American mythology. Star Wars had been booked for a four-week run at the theatre, so fans had to wait while Sorcerer hogged the screen for six weeks. Fans contented themselves with seeing the film out in Century City, but it just wasn't the same. The Chinese and Star Wars were a perfect match. When the film returned at the beginning of August, a huge crowd turned out to see R2D2, Darth Vader and C3PO make their marks in the Forecourt. With the passage of time, people have come to realise that there were actors playing each of these characters. 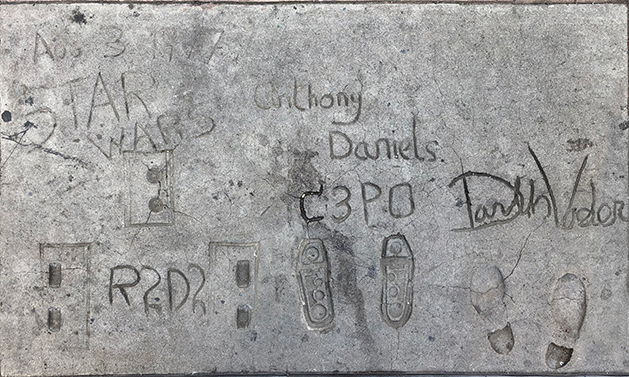 Only Anthony Daniels, who played C3PO, signed his own name on the block. We are pleased to include their bios to our Forecourt pages. 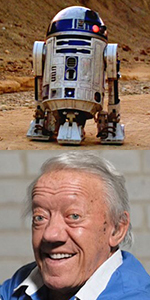 Kenny Baker as R2D2 in Star Wars, released in May, 1977, and Kenny Baker, circa 2000. Kenny Baker was born with dwarfism in Birmingham, England to full-sized parents, Ethel, a dressmaker, and Harold, an artist and musician. His parents sent Kenny to boarding school in Kent, then divorced. He went to live with his father and his new wife in Hastings, Sussex. At the age of 17, Baker was standing on the street when a woman asked of he would like to join a theatre troupe of little people. Kenny enjoyed his first taste of showbiz, later joining a circus, where he learned to ice skate. He appeared in many ice shows after that. He eventually formed a comedy nightclub act with short statured Jack Purvis; an act they called the "Minitones." Baker had appeared in a few films, including playing Dopey in a television version of Snow White and the Seven Dwarfs, aired over BBC, in January, 1966. He was not particularly impressed when he was offered the job of operating R2D2 in Star Wars, initially turning it down. After reconsidering, he enjoyed working on the film. While working on the children's film Wombling Free (released in December, 1978), Baker met fellow acting dwarf Eileen . They married shortly after the film wrapped. Their two children are full-sized. After playing R2D2 in The Empire Strikes Back (released in June, 1980), Baker took the part of the Plumed Dwarf in The Elephant Man (released in October, 1980) with John Hurt, and played Figit in director Terry Gilliam's Time Bandits (released in November, 1981). Baker returned to his R2D2 costume for Return of the Jedi (released in May, 1983), and appeared in Amadeus (released in September, 1984), and was in the ensemble of Willow (released in May, 1988). Baker kept moderately busy in television during the long wait until Star Wars: Episode I - The Phantom Meanace (which played the Chinese in May, 1999), Star Wars: Episode II - Attack of the Clones (played the Chinese in May, 2002), and Star Wars: Episode III - Revenge of the Sith (released in May, 2005). In poor health, Baker was to perform R2D2 in Star Wars: The Force Awakens, (which played the Chinese in December, 2015), but served as consultant instead. He could not attend the film's premiere in Los Angeles; he attended in London. His last film was When the Devil Rides Out. He passed away in August, 2016, just eleven days before his 82 birthday. Mann's Chinese Theatre, Hollywood California. Star Wars Characters Forecourt ceremony, Wednesday, August 3, 1977. 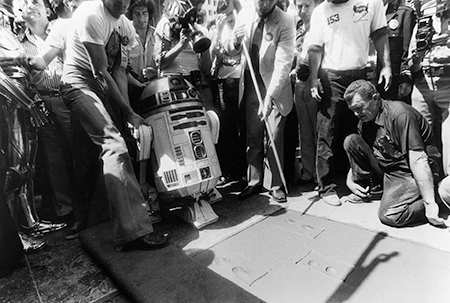 Kenny Baker as R2D2 is lifted into the cement by a squad of unidentified assisstants. David Prowse as Darth Vader in Star Wars, released in May, 1977: David Prowse during filming. 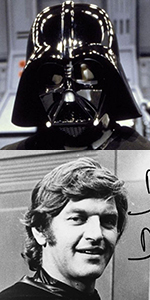 David Prowse grew up in Bristol, where he won a scholarship to attend Bristol Grammer School. Tall, he developed an interest in bodybuilding, earning his spending money as a bouncer, and a swimming pool attendant. Prowse won the British heavyweight weightlifting championship in 1962. The following year he relocated to work at a weightlifting company in London. He made his first film, then appeared as Frankenstein's Creature in Casino Royale (released in April, 1967). Somehow, he got a guest shot on The Beverly Hillbillies, aired over CBS in October, 1968. Returning to the UK, Prowse again played the Frankenstein Monster in The Horror of Frankenstein (released in June, 1971), with Ralph Bates as Victor, an has a small role in Clockwork Orange (released in December, 1971), as the writer's bodyguard Julian. He played a Minotaur on Doctor Who, aired over BBC in June, 1972, and played an android in The Tomorrow People, aired over ITV in July, 1973. In the US, Prowse played a sawmill foreman on Little House on the Prairie, aired over NBC in October, 1975. When he was cast to play Darth Vader in Star Wars (which played the Chinese in May, 1977), he was surpised to learn that his lines, spoken on set, would be replaced by actor James Earl Jones. After auditioning to play the title role in Superman, the Movie (which played the Chinese in December, 1978), Prowse became Christopher Reeve's trainer in all the Superman films. Prowse played Darth Vader onscreen in both The Empire Strikes Back (released in May, 1980), and Return of the Jedi (released in May, 1983). He played Cassius in the television show William Tell, aired in syndication in 1989. Prowse spent considerable time building up a chain of weightlifting gyms, The Dave Prowse Fitness Centres. Although he played Darth Vader as recently as 1997 for the video game Monopoly Star Wars, Prowse was passed over to play him in the Star Wars prequel films; this situation saddened Prowse considerably. He consented to appear in the protest / documentary Saving Star Wars (released in June, 2004), and has promoted it at Star Wars conventions. Prowse is heavily featured in the Spanish documentary, I Am Your Father (released in October, 2015). His last film credit is the television show Mission Backup Earth, released in April, 2016). Due to lifelong difficulties with arthritis, Prowse officially retired from acting and public appearances in October, 2016. Mann's Chinese Theatre, Hollywood California. Star Wars Characters Forecourt ceremony, Wednesday, August 3, 1977. 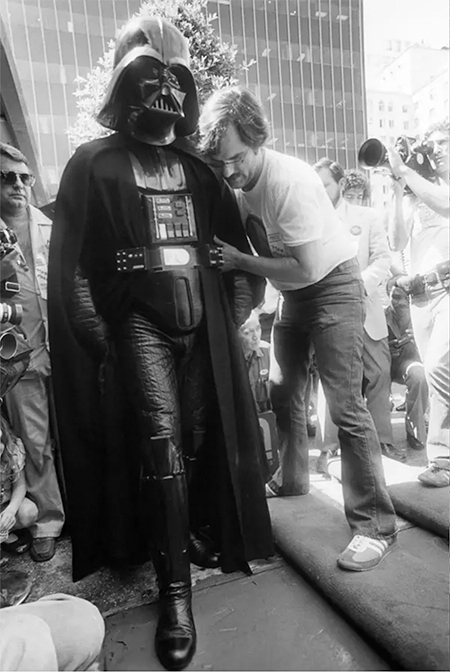 David Prowse as Darth Vader is helped into the cement by an unidentified assisstant. Anthony Daniels as C3PO in Star Wars, released in May, 1977: Anthony Daniels during filming. Anthony Daniels's father was a plastics company executive, who sent his son to the Giggleswick School, a boarding school in Settle, North Yorkshire. Daniels originally went to university to study law, but like others before him, found the stage to be more interesting. He found a spot on BBC Radio in 1974. He also performed for the National Theatre and The Young Vic in London. His only film prior to Star Wars was a guest slot on the show Centre Play, airing over BBC in December, 1976. When he first heard about auditioning for Star Wars, he dismissed it, but upon reconsidering, accepted the role. 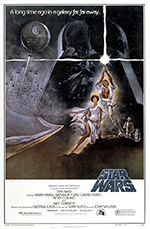 Star Wars (which played the Chinese in May, 1977), was only the beginning. After doing the voice of Legolas in the animated The Lord of the Rings (released in November, 1978), Daniels went on to play C3PO on loads of tevelviision programs, including several episodes of Seasame Street aired over PBS in March, 1980. Daniels has the distinction of appearing in all of the Star Wars films, continuing with The Empire Strikes Back (released in May, 1980), and Return of the Jedi (released in May, 1983). Venturing into the past, Daniels had a large role in the television mini-series The Country Diary of an Edwardian Lady, aired over CIT in February, 1984, and delved into biker pictures with I Bought a Vampire a Motorcycle (released in 1990), and made a forray into cable-land with The Adventures of Young Indiana Jones: Attack of the Hawkmen, aired over The Family Channel in October, 1995. He was available for all of the "prequel" films: Star Wars: Episode I - The Phantom Meanace (which played the Chinese in May, 1999), Star Wars: Episode II - Attack of the Clones (played the Chinese in May, 2002), and Star Wars: Episode III - Revenge of the Sith (released in May, 2005). Aditionally, he has provided the voice for an animated C3PO in Star Wars: The Clone Wars, aired over the Cartoon Network, from 2004-2005 and 2008 to 2011. 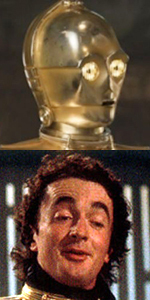 Daniels now rarely does anything other than play C3PO in the repidly-expanding Star Wars franchise. He does the voice for the driod in Lego Star Wars: Droid Tales, aired over the Disney Channel, in July, 2015, plays the character in Star Wars: The Force Awakens (which played the Chinese in December, 2015), and Star Wars: The Last Jedi (played the Chinese in December, 2017), and anything else they can dream up for him. Daniels is an adjunct professor at Carnagie Mellon University, in Pittsburgh, Pennsylvania. Mann's Chinese Theatre, Hollywood California. Star Wars Characters Forecourt ceremony, Wednesday, August 3, 1977. 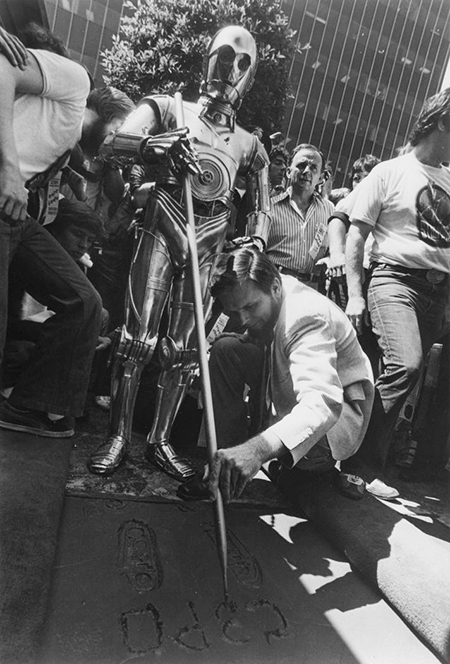 Anthony Daniels as C3PO is helped with inscribing his autograph into the cement by an unidentified assisstant.